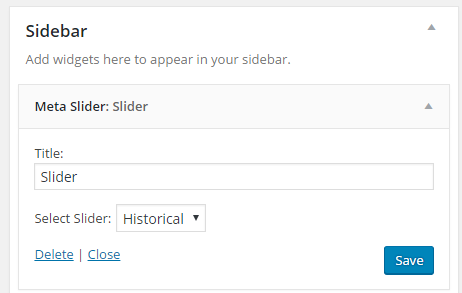 The Meta Slider plugin enables you to quickly add a slideshow to posts, pages and sidebars. After activating the Meta Slider plugin in Plugins > All, you will see a new Meta Slider menu item added to your main navigation. 2. Click on the “+” button to create a new slideshow. 3. A new empty slideshow will be created. 4. Click on the New Slider field and replace with the name of your new slideshow. 5. Click on Add Slide button to add a slide. 6. 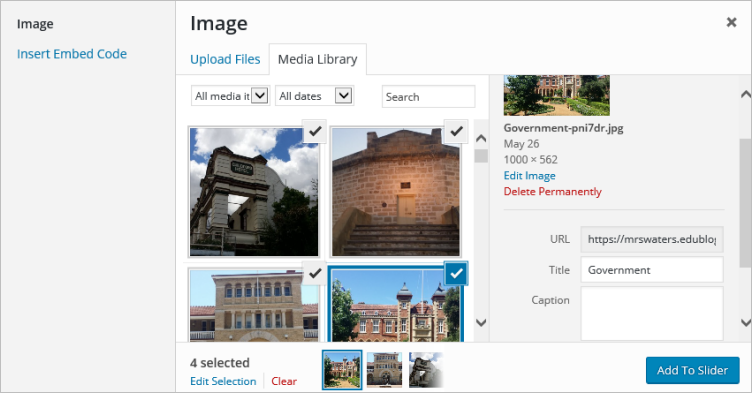 The Add Media window will load where you can upload images from your computer or select existing images from your media library. Hold CTRL to select multiple images. Click Add to Slider to insert into your slideshow. 7. The slides will be added to the slideshow and you can drag/drop the slides to re-order them. 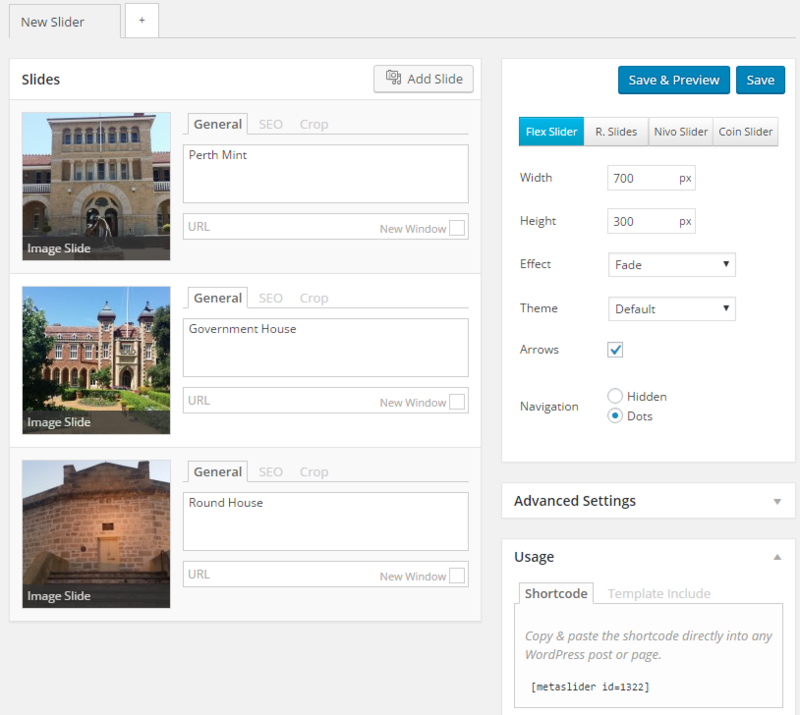 General – add the slide caption and URL. HTML allowed in slide caption. SEO – set AL and Title text for the slide image. Crop – adjust the crop position of the slide. 8. Using the Slideshow settings on the right hand side of the page to select the type of slideshow you want to add. Slideshow types include Flex Slider, R. Slides, Nivo Slider and Coin Slider. 9. Click Save once you’ve finished customizing your slider. 2. Place your cursor where you want the slider to appear and then click on the Add Slider icon. 3. Select the slider you want to add and then click Insert Slideshow. 4. The metaslider shortcode will be inserted into your post. 5. When you view your published post or page you’ll see your new slider. 2. Add the Metaslider widget to the desired sidebar. 3. Add the title, select the slider you want to display and click Save.